The next Cars & Coffee Brisbane is on Saturday the 5th of May at Coorparoo. Before I mention anything else; we really need to address some parking issues. A number of businesses in the vicinity are open on a Saturday morning. ****If you park in the following properties you will be towed away. The Bone Clinic at 26 Turbo Drive, The Florist at 54 Turbo Drive, Theatre & Dance at 21 Castlemaine St, Fort Knox Storage at 1/8 Castlemaine St or Model Consultants Int 17 Castlemaine St**** Please show our neighbours the respect they deserve. 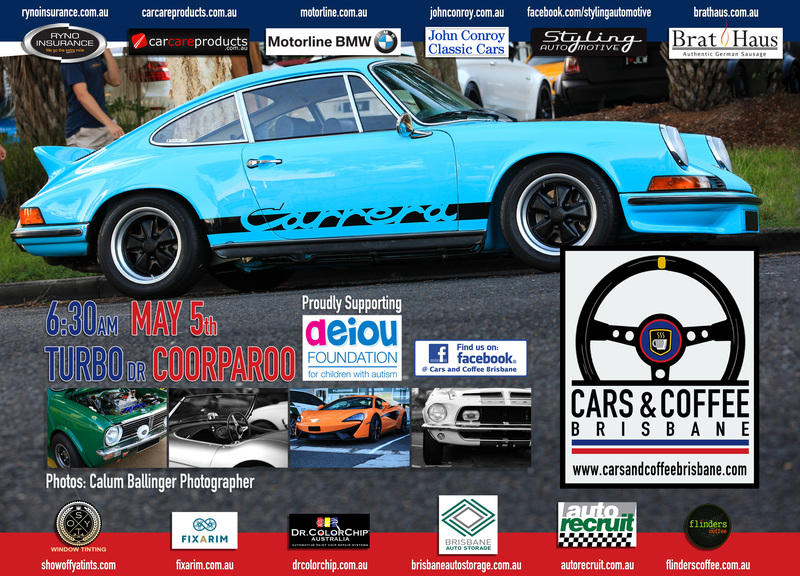 We would like to thank our ongoing sponsors John Conroy Classic Cars, The Bratmobile, Dr ColorChip Australia, Styling Automotive, Show off ya Tints, Ryno Insurance Services Pty Ltd, Car Care Products, Flinders Coffee, Motorline BMW, Fixarim, AUTOrecruit & Brisbane Auto Storage (www.brisbaneautostorage.com.au).